PVREA recently used a technology that the co-op has never used before – drones. PVREA recently used a technology that the co-op has never used before – drones. These cool, trending devices are flown remotely to capture high quality video and photos. Many hobbyists use them to get cool shots of their family’s farmstead, or an aerial shot of scenery. PVREA is using it to help deliver safe, affordable and reliable power to you, our member. Drones have a significant and efficient use in preventive maintenance. PVREA hired a local company out of Fort Collins, UAV Recon, to assess our 69,000 volt (69kV) transmission line that connects our mountain region members. Using the co-op’s mapping data, in a few days, UAV Recon flew their equipment over the 38-mile long transmission line. They captured data of the route and returned with a detailed summary for each of the 375 poles, equipment, wires, transformers, and insulators. This bird’s-eye angle was very valuable to the co-op as details were found not visible from a ground-up view. 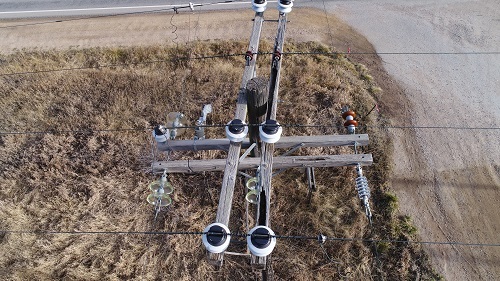 UAV Recon pinpointed equipment needing attention, giving PVREA the exact location where our crews can efficiently go to fix issues and replace equipment to prevent future power outages. This eliminates several hundred hours of time and expense to patrol the lengthy line, also eliminating access issues a lineman would encounter to inspect on foot or from a vehicle. UAV Recon is FAA Part 107 certified for commercial operations within the US National Airspace System. Their niche in aerial equipment assessments is specifically designed for co-ops. As we validate new technology, the use of UAV Recon safely proved to help reduce operating costs and increase reliability. PVREA will continue to use drones for future maintenance projects. If you have any questions, please contact PVREA at 1-800-432-1012.